Didier Depond was in town briefly a couple of weeks back and one of the things we did was a small lunch for a few members of the press who couldn’t make the Salon 2002 Uk launch back in March. I was lucky to get the call and really enjoyed a tasting followed by lunch. The same wines were served at each. This may seem strange but far from it – getting the chance to taste and analyse a wine and then separately to drink it and see it develop in glass is actually not something I get to do that often. Delamotte Blanc de Blancs NV (Magnum) I am completely biased in loving this wine almost more than any vintage. When I finally get my priorities sorted I will lay down a decent batch of it (in bottles and magnums) and give it the extra 3-4 years I like (Delamotte ages their wines double the required amount anyhow). I love traditional bottle ageing of Champagne far more than late disgorgement. This is all about white flowers and poise, a little toast and spice but minerality. Delamotte Blanc de Blancs 2004 Drinking very well already, this will age well but is probably best drum before the Delamotte 2002 which is more strict and taut. There is generosity of white fruit again but a honeyed note also, then a finish which has a lovely saline edge. 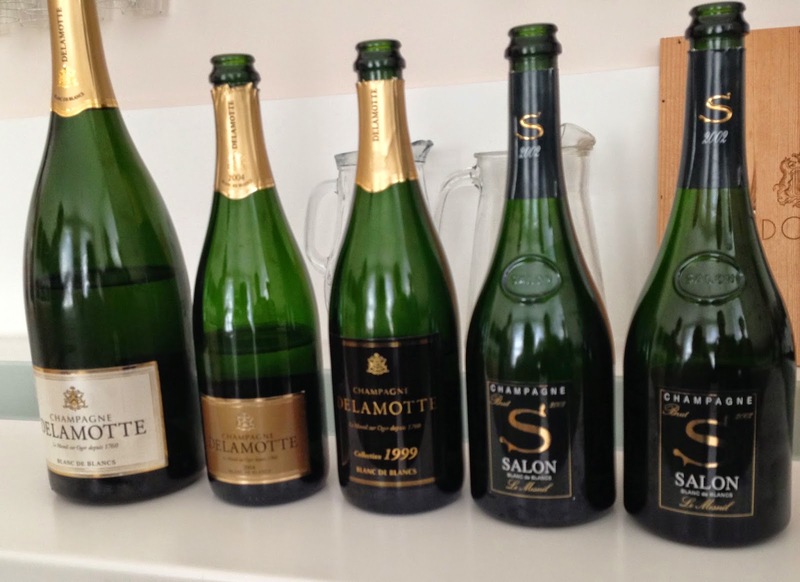 Delamotte Blanc de Blancs Collection 1999 A recently disgorged bottling of the 1999 (the normal bottles are spot on now as well!). 1999 was a sunny and warm vintage. This has a fairly opulent nature, reminding me of Meursault more than Puligny, there is also a briney character, this is complex and spot on now, no rush mind you. 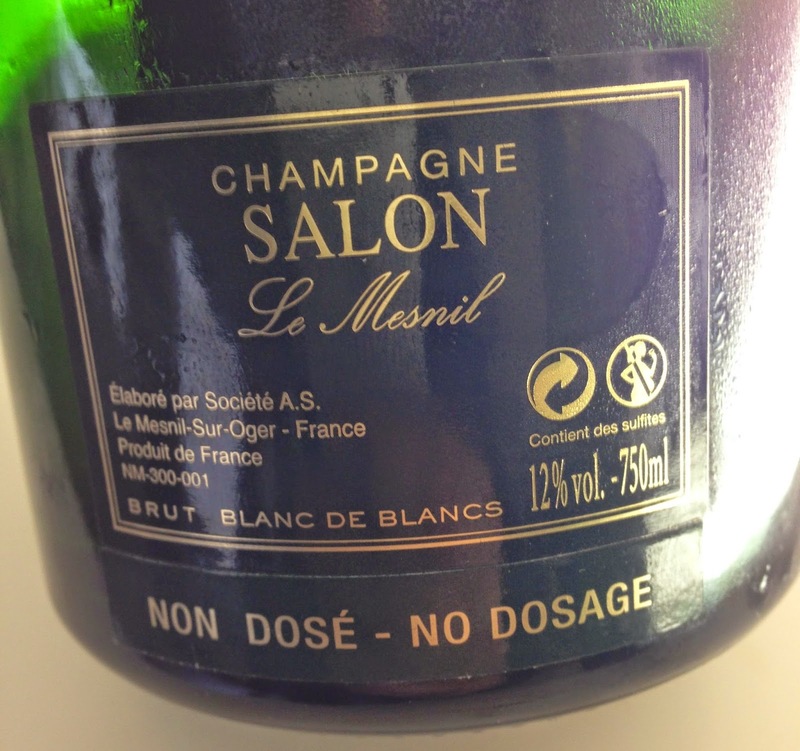 Salon 2002 “Non Dose” A unique wine that is actually only served in “Sketch” restaurant in London. As the name and pic below suggest there is no dosage. The nose is very classy Blanc de Blancs, very focussed, not overly tight but very hard to describe, a wine giving little away but with layer upon layer of nuance. It is on the palate that you can see the uniqueness of this, there is a real tension and cleanliness, almost a little tannic bite too. And so the guests left energised! !